If there is one thing the Bed King team admires, it’s clever design. This is why we are so proud to be a stockist of Trento Upholstered Drawer Bases. There are very few manufacturers out there who can walk the fine line between making a beautiful product and crafting a user-friendly piece of furniture, and Trento did so to a T.
If there is one thing we can all use more of, its inconspicuous storage space. Do you have a chair in your room that becomes a clothes avalanche as the week progresses? Or a bunch of nondescript boxes stashed beneath your bed that drive your partner nuts? This is not an uncommon sight in South African bedrooms. Available in single, three-quarter, double, queen and king, the Trento Drawer Storage Base features two drawers that are placed on both sides of the base to allow maximum storage space for your extra bedroom items. Single and three-quarter bases have two drawers on one side only, so when you order one of these you have the option of choosing on which side the drawers should be placed. If you’ve been wondering whether a hollowed-out bed base is such a great idea, we’ve got excellent news. The Trento Drawer Base features a Rhino Tough Top Foundation - a solid top that can comfortably take up to 500 kg of weight. As such, there is no need to fear it buckling or becoming structurally unsound due to the presence of the drawers. Designer furniture can sometimes err on the side of form over function, but the Trento Upholstered Drawer Base is a notable exception to this rule. Manufactured from solid SA Pine, the drawer storage base offers generously padded sides upholstered in a stylish grey fabric that will compliment any bedroom setting. The drawers are also placed towards the lower end of the base so you don't need to move your bedside table every time you need to access the uppermost storage unit. Clever, right? These are just a few of the reasons why we are so excited to have Trento Upholstered Drawer Bases on our showroom floors. Would you like to learn more about this product? Feel free to get in touch with the expert Bed King team to discuss your requirements in person. 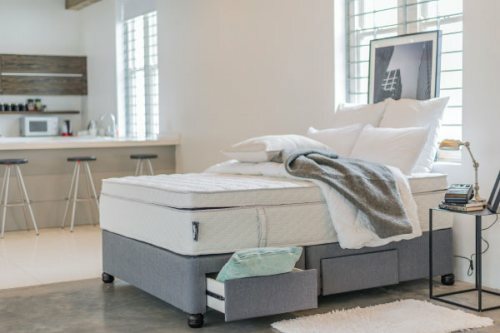 We’ll be happy to share our inside knowledge on bed bases, comfort-grade mattresses and more.